The notorious “chicken wing” is viewed by many as a defining trait of a newbie. 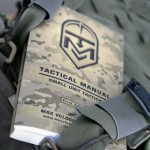 Tactical instructors, and the enthusiasts who follow them, will all claim it’s a surefire way to get your arm shot off in a fight. The standing position is simultaneously the most common and least useful of the standard rifle positions. The thing is, outside of competition, if you need to use it then you need to use it right now! Kneeling is a moderately stable position, being better than standing but not as good as sitting or prone. You might find it better than squatting, given the larger base on the ground, but it performs much worse for me. The sitting position is moderate to high stability, depending on your body mechanics. You will get slightly lower than kneeling or squatting but stay above most brush and grass. Kyle Lamb, in Green Eyes Black Rifles, points out that sitting is also convenient because it can be held for a long time compared to some of the others.